Rufous-vented Chachalacas are fairly similar to turkeys in appearance. They are very noisy, uttering their calls at dawn. 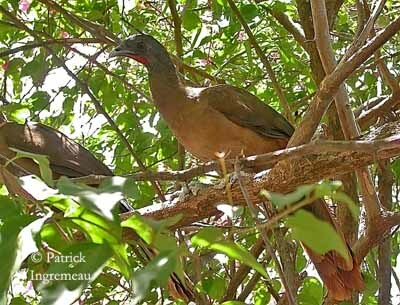 The Rufous-vented Chachalaca is featured on Trinidad and Tobago coat of arms with the Scarlet Ibis. 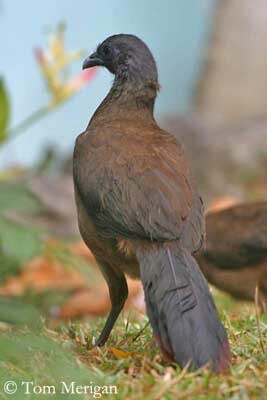 The chachalaca, or Cocrico, represents Tobago, whereas the ibis represents Trinidad. Adult has dull plumage, with dark brown upperparts. Flight feathers and uppertail are blackish-brown. Underparts are greyish-buff, turning rufous on vent and undertail coverts. Undertail is blacksih-brown tipped rufous. Head and upper neck are grey with red bare skin on chin sides. The strong bill is pale grey. Eyes are dark brown. Legs and feet are robust and grey. Female is similar in plumage but smaller. We can find two subspecies “ruficauda” and “ruficrissa”. The latter has white-tipped undertail and slightly brighter colours. Rufous-vented Chachalaca is very noisy and mainly at dawn. The male gives loud, low “ka-ka-rooki-rooki-ka”, and the female responds with a higher-pitched “watch-a-lak”. They utter clicking notes, a low rising whistle, and also a harsh squawk when alarmed. We can hear a loud chorus at dawn. Rufous-vented Chachalaca is common in thorny deciduous brushland and forest in open areas, dry thickets and gallery forest. This species is often near the water, along streams or near lagoons. This is mainly a bird of lowlands, abandoned farmlands with second growth and palms, and clearings in moist forest. 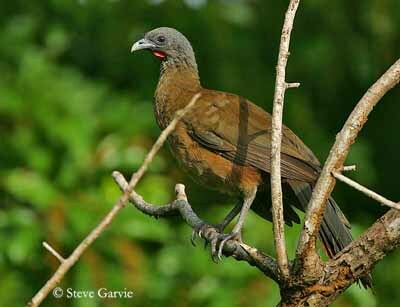 Rufous-vented Chachalaca is found in NE Colombia and N Venezuela where it may be seen up to 1600 metres of elevation. It also occurs in Tobago, and has been introduced on Bequia and Union Island in the Grenadines. 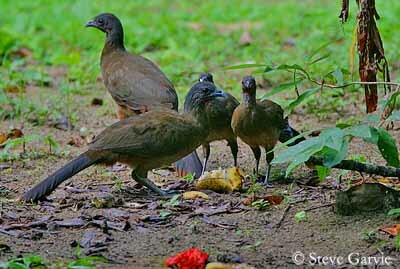 Rufous-vented Chachalaca forages in flocks of about 4-20 birds, sometimes up to 50. This is an arboreal species, walking along the branches, searching for fruits, seeds, tender shoots and leaves. Groups can be seen also on the ground, foraging for seeds and fallen fruits. They usually feed in the early morning and the late afternoon. They rest during midday, and also perform preening, dust-bathing and sunning. 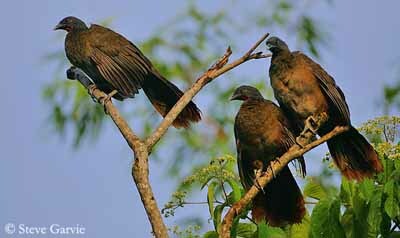 During the breeding season, Rufous-vented Chachalaca performs chorus in the early morning, starting after sunrise, during one or two hours. During the day, some short outbursts of about five minutes can be heard. Occasionally, the chorus may be heard again in the late afternoon. Courtship displays seem to be simple. The male struts while calling with head erect. Both sexes perform mutual preening, pecking, some rapid chases and courtship feeding, equally on the ground or in treetops. 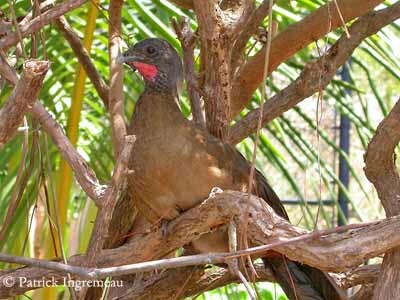 Rufous-vented Chachalaca is probably sedentary in its range, but this behaviour is poorly known. Rufous-vented Chachalaca is able to take off vertically, and flies well, but mainly over short distances. Sustained flights are rare, but they can perform long glides with the support of their long tail, after a flurry of wing-beats. Breeding season occurs all year round on Tobago, with peak between March and June. In Colombia, laying occurs in July. The nest is usually placed in tree, mainly between one and three metres above the ground, but occasionally up to 20 metres. This species may sometimes nest on the ground at grassy clearing edges. The nest is made with sticks and leaves, sometimes lined with fresh vegetation. Female lays 3-4 white eggs. Incubation lasts about 28 days, by female. The male often remains near the nest-site, watching for intruders. The female leaves sometimes the nest to feed, but she returns quickly if it begins to rain, to protect eggs and nestlings. Chicks are highly precocial and leave the nest very soon after hatching, from a few hours to one or two days. They are able to grasp branches and climb through the vegetation. They also can flutter over short distances 3-4 days after hatching. Youngs are fed by adults which give them regurgitated food in the bill tip. They also pluck on the ground after some days. They remain in family groups during some weeks. 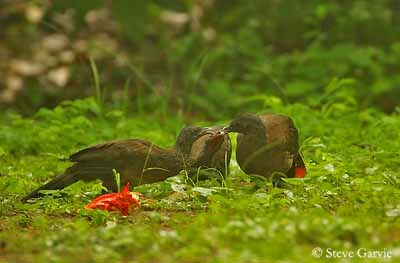 Rufous-vented Chachalaca feeds mainly on fruits and leaves, but it also consumes tender shoots, flowers and seeds. They forage in groups in trees and on the ground. 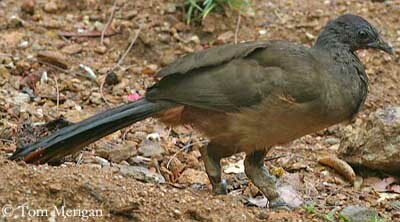 Rufous-vented Chachalaca’s populations are secure in Tobago, and the species is common in Colombia.